There’s not a lot of value in writing about baseball trends after six games. Everything that’s written for the next three weeks or so will be peppered with asterisks and disclaimers about how none of this data is worth taking seriously. While it’s probably true that Xander Bogaerts isn’t going to hit .455 for the rest of the season — I’m not ruling it out, though — there are some overall team trends worth taking a look at. The big narrative this offseason was how the additions of Alex Cora and J.D. Martinez were going to be the makeover this team desperately needed. There would be homers aplenty; the gaps would be filled with doubles. Instead, seven games in and the 2018 Red Sox look a lot like … the 2017 Red Sox. Let’s start with what’s been different, though. From the day that Alex Cora was introduced as the manager, it was abundantly clear that this Red Sox team would be more aggressive at the plate — especially early in the count. From the eye-test perspective, that much has been true so far. 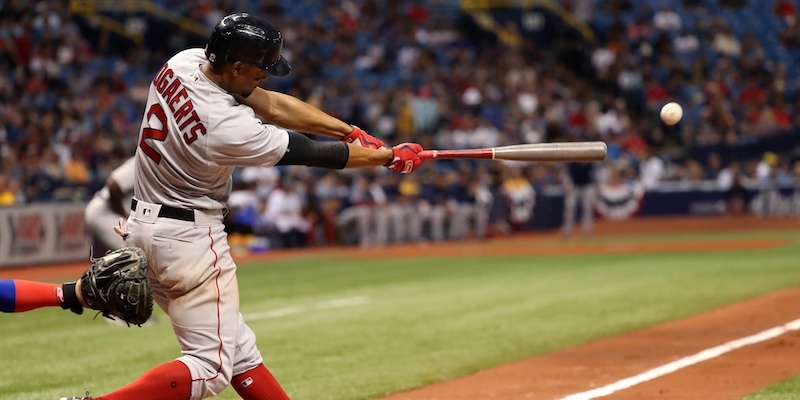 The numbers back it up: the Red Sox are swinging noticeably more than they did last year. After swinging at roughly 43 percent of the pitches they saw last season, the team is on pace to swing at a 47 percent clip this season. If that number holds, it would be the highest swing percentage that the team has posted in over 20 years. The Red Sox aren’t just being more aggressive, they’re being selectively aggressive. Even with the rise in swing percentage, the Sox aren’t chasing bad pitches. In fact, the percentage of times they’re swinging at pitches out of the zone is pacing one percentage point lower than last year. Jumping on strikes, however, is a different story. After swinging at 62 percent of balls in the zone last year, the team is coming up to the plate hacking at 71 percent this season. A common criticism of the team last year was that the best hitters were being almost too selective at the plate, so being this aggressive right out of the gate is an encouraging sign. So why don’t the results look any different? First off, these things take time to even themselves out. If the team continues to be this aggressive, the results will look significantly different in a month. Last year, the Red Sox batted .277/.365/.436 with runners in scoring position. This season, under the same circumstances, they’re currently hitting .186/.286/.349. Last season, the Red Sox finished the year with an exactly league-average BABIP. This year, their BABIP is currently 20 points below league average. There are definitely reasons to be wary. The two team’s batted-ball profiles look shockingly similar. This year’s squad hasn’t gotten on base at quite the same rate so far. They’re middle of the road in just about any power-measuring stat you look at. Like I said at the top, it’s hard to read into numbers too seriously while we’re still in the part of the MLB schedule that’s susceptible to snow delays. These things take time, and Cora himself even said that he thinks the team is pressing a little too much right now. The similarities between 2017 and 2018 have been surprisingly evident so far, though, and are worth watching closely as the first few weeks of baseball get underway. I wonder whether the extended stay in Florida has had an effect. Sure, for some of the guys Florida is actually home (Sale, Hanley, etc. ), but for a lot of other players it’s like spring training got extended in a weird way. Just a thought. I think they’re gonna rake at Fenway this weekend. A Sale start and a JBJ at-bat are the Scylla and Charybdis of Sox baseball. If Hanley and Price are the saviors of this club, then mountains will heave in your backyard and seas wash over the land. Let’s make some trades! How are those mountains in your backyard doing? Plenty of time for apocalyptic geological upheaval. On another front, may I add how deflating it is that Marcus Weldon has to go down to AAA and both Hector and Brian Johnson have to go to the pen to make room for the return of E-Rod, the Chris Sale bookend of towering inefficiency? Let’s make some trades!